The largest community park in Parsons is covered with beautiful trees of multiple varieties and sizes. The canopy of trees provide shade for the multiple activities in the park. Whether strolling on the network of decorative paths, waiting for a ride on the Kiwanis' Pancake Special train, or enjoying a summer concert, the park is a picturesque setting for a relaxing afternoon in Parsons. The Park plays hosts to several Parsons events each year. 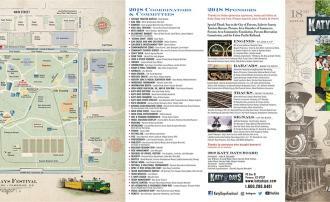 Katy Days is held on Memorial Day Weekend, and is a celebration of the City's railroad heritage. The event draws over 5,000 people to the park for music, food, a parade and numerous activities and presentations. Forest Park also hosts the annual Community Fourth of July Celebration, the Music in the Park Summer Concert Series (Thursday evenings in June and July) and various other celebrations and activities. Amenities in the park include, 3 shelter houses and picnic areas, 3 playground areas, 2 sand volleyball courts, horseshoe pits, lighted tennis courts and a 9 hole frisbee golf course. Adjacent to the park is the Arvon Phillips Community Center, the community Swimming Pool, 2 lighted softball fields and the Labette Community College campus.